As our week in the United Arab Emirates progressed, our Children’s National delegation grew. We were joined by Elizabeth Bradshaw, RN, Fran Cogen, MD, Jill Joseph, MD, PhD, and Gerard Martin, MD. Every member of our team was there for a specific purpose, all related to building positive relationships with our partners in the United Arab Emirates, and working to find ways to help improve healthcare for children around the world. Members of our delegation traveled to different parts of the Emirates over the last week, speaking on issues including obesity, diabetes and heart problems and engaging in valuable discussions with medical experts on the ground. On Wednesday, January 26, Evan Nadler, MD, gave a talk to an audience of approximately 250 medical professionals from around the region and the world at the Arab Healthcare Congress in Dubai. He addressed the issue of obesity in children and surgical options available today. Obesity is a challenge facing children in every part of the world today and exchanges of information between medical experts will be the key to finding ways to address the problem. Larry Mahan, PhD, spent part of the week in Dubai, where he attended sessions at the Arab Health Congress, meeting with representatives from medical technology companies as well as medical experts discussing innovative ideas that might bring new solutions to the problems in pediatric surgery. He also took part in the US-UAE Healthcare Trade Mission, learning more about the challenges and opportunities that exist in the healthcare arena in the United Arab Emirates. 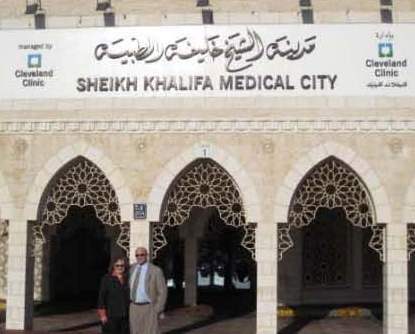 Gerard Martin, MD, and Elizabeth Bradshaw, RN, traveled to several cities in the Emirates, speaking with physicians and nurses about heart conditions in babies and exchanging best practices with their colleagues. Fran Cogen, MD, gave several talks on diabetes throughout the week at different hospitals and culminated her trip with a presentation on diabetes diagnosis and treatment at the Arab Healthcare Congress in Dubai on Thursday, January 27. Other members of our delegation, including Jill Joseph, MD, PhD, spent their time engaged in partnership discussions with key members of the Health Authority-Abu Dhabi identifying ways to work together to help improve the health of children in Abu Dhabi. Part of our Children’s National delegation returned to Washington, DC, today and the remaining members of our delegation will come home tomorrow. As we had our final dinner together in Abu Dhabi last night, one common reflection on their time and exchanges in the UAE, was that despite the miles and cultural differences between us, when you take time to speak with people, you can’t help but notice just how similar the challenges we face really are. We are all tied together by a common interest to find innovative solutions to solve the problems of surgery in children, and we are open to working together to reach that goal. Our Children’s National delegation has been very busy in both Abu Dhabi and Dubai since our last post. Here are some highlights of our team’s work over the last few days. Some of our team members have been busy attending meetings with the U.S.-U.A.E. Healthcare Trade Mission and the Arab Healthcare Congress. Our delegates have met with leaders of local health authorities, pharmaceutical companies, and businesses in the region. These meetings have provided great insight into the healthcare environment in the United Arab Emirates and the Middle East, which will help our Children’s National team continue to support the partnership that created the Sheikh Zayed Institute for Pediatric Surgical Innovation for the children of the world. A story from last week's print edition of Time Magazine featured the use of robotics in adult surgery. It's a decent outline of the pros and cons of the current debate about cost vs. benefit for robotic surgery in adults, based on the current technology in use. Though widely used in adults, robotic surgical techniques for children are still fairly limited. The number is growing, but at present only a handful of children's hospitals in the United States are using the technology. In the fall, Children's National appointed urologist Craig Peters, MD, as chief of Surgical Innovation, Technology, and Translation and principal investigator in the Sheikh Zayed Institute. Dr. Peters's work focuses on adapting robotic surgical techniques, and the teaching of these techniques, into more aspects of pediatric surgical care. The Time article highlights the heated discussion about robotics by experts in the field of surgical technology. But author David von Drehle also points out just how important thinking creatively and focusing on innovation in medicine can be to developing better therapies for the future. "Other robotic advances offer tantalizing glimpses of a mechanized medical future. By marrying high-tech imaging machinery to robotic tools, surgeons may journey into even more-remote, less accessible regions of the body with perfect surgical precision." These possibilities sound familiar to the faculty at the Sheikh Zayed Institute, who came to Children's National in order to work collaboratively on techniques, therapies, and devices that will make surgery for children less invasive, more precise, and possibly even one day pain free. As part of that work, Dr. Peters and the team from the bioengineering initiative will work to develop new and better techniques in robotics, imaging, and other minimally invasive surgeries, just like those outlined above, but tailored specifically to the unique needs of children. On Thursday, several members of our Children’s National delegation left Washington, DC, for Abu Dhabi. Over the next few days, our team will participate in the Arab Health Congress 2011, the U.S.-U.A.E. 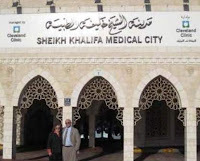 Healthcare Trade Mission, attend partnership meetings with the Health Authority-Abu Dhabi (HAAD), and meet with colleagues from local hospitals. Evan Nadler, MD, principal investigator of the Systems Biology Initiative at the Sheikh Zayed Institute for Pediatric Surgical Innovation and Co-Director of the Obesity Institute at Children’s National shared his keen interest in learning more about Health Authority of Abu Dhabi (HAAD) efforts to combat the obesity epidemic, which he believes will help us improve our approaches as well. We will continue to share our experiences throughout this trip, please check back for updates. Raj Shekhar, PhD, has joined Children’s National Medical Center as principal investigator in the Bioengineering Initiative of the Sheikh Zayed Institute for Pediatric Surgical Innovation. A research professor, engineer, and entrepreneur, Dr. Shekhar will join the Institute’s interdisciplinary bioengineering team to focus on surgery innovations involving the fusion of various current surgical and medical imaging technologies.